Truck Facts: 2000 Ford F-350 extended cab. Patrick Chassis Truck (Not pictured). 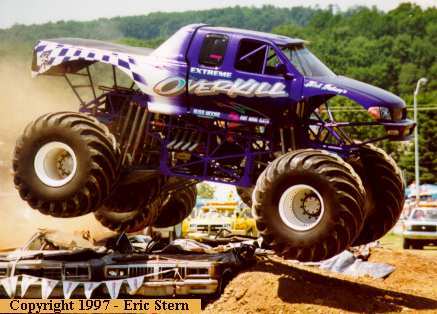 Extreme Overkill is the only truck to incorporate a 4-link swing arm type suspension system utilizing Kuster Air-Springs and bypass shocks which provide the truck with 36" of wheel travel. 572ci Ford alcohol injected motor. 8-71 Blower with Ford Motorsport heads allows 1500+ horsepower. Approximate weight is 10,000 pounds. Finished 5th in the 1997 Special Events Points Series. 1996 U.S. Hot Rod Thunder Nationals Champion. (2 wins - 2 runner up finishes in 4 years). Finished 8th in the 1996 PENDA points series. Sponsors: Ford Motorsports Division, Stephens and Hull Race Engines, Russ Moore Transmissions, Cook's Body Shop, Ft. Wayne Clutch, Inc., Lund Industries, Auto Meter Products, L&L Products, Bell-Tech, Knaack Manufacturing, Ramsey Winch Company, Kendall Motor Oil, and Trailmaster Suspensions.